During the last one week, the people of Bangladesh were very solicitous over the issue of the verdict of Khaleda’s Zia Orphanage Trust case. Both the BNP and ruling AL remained very busy in establishing their own position on the merit of the case. On the part of the BNP, they remained busy in establishing the fact the government is manipulating the verdict of the case in order to create a situation in the country so that Khaleda Zia and the BNP do not take part in the upcoming election. On the other hand, AL leaders remained busy in arguing that they do not have any linkage with this case. In between this tug of war, a dismayed environment was created in the country where every citizen was expecting a deadlock if Khaleda Zia is convicted. Finally, we heaved a sigh of relief as the law and order situation remained under control even after the declaration of the verdict. The main intention of this write-up is to make an analysis of this verdict on the political environment of the country. The BNP leaders were apprehending that conviction would disqualify Begum Zia to contest the next parliamentary election. But, from the legal point of view, I do not think that they should be afraid of this fact as there is a provision of law that permits Begum Zia to file an appeal before the higher court. Along with the appeal application, she will also have to file an application for her bail and withholding of the verdict of the lower country. If the court grants her bail and withholds the verdict of the lower court, she will be able to contest the next election. From this perspective, the BNP leaders should go with the decision of the court. It is noteworthy that while addressing the press before the day of the verdict, Begum Zia showed her maturity in providing direction to the leaders and supporters. She instructed all of the leaders and supporters to continue peaceful movement. However, the way the BNP leaders expressed their comments over the activities of the court in the last one week, is really outrageous for the independence of the court. If AL leaders aspire to use this verdict as a trump card in the upcoming election, I do not think it would help them as the people of Bangladesh do not consider all these issues during the election. In most cases, they are driven by their emotions than logic. Thus, the supporters of the BNP would not lose their confidence on Khaleda Zia and her family. 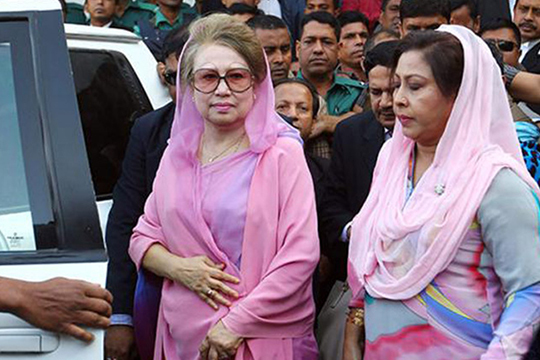 In other way, there is a possibility that Khaleda Zia may gain sympathy from the voters. Of course, this dynastic politics hinders the process of development of leadership in the country which is also equally true for the AL. As a matter of fact, it is the main feature of our South Asian political culture. After Begum Zia has been convicted, Tarique Zia has been made the acting chairperson of BNP by virtue of his position of senior vice president of the party. One may wonder why Khaleda Zia has made him the acting chairperson when he remains outside the country. To me, there are two possible answers to this question. First, for keeping control on the party, Begum Zia opted to choose him as the party chief in her absence. Secondly, there might be some intra-group conflict had Begum Zia made some other leader as an acting chairperson of the party as she had to choose someone from a pool of equally able leaders. Thus, she did not prefer any other leader. At the same time, Begum Zia’s decision to make Tarique Zia as the acting chairperson would add some fuel to AL as they would try to capitalise this decision by arguing that the acting chairperson of the party has already been convicted twice in graft cases. It is important to mention here that the verdict of this graft case has been highlighted in the international media. Now, it is the time to see how international communities express their reaction to this verdict. Of course, the intensity of pressure depends on the strength of the lobby of the BNP leaders with the international communities. This may come out as a crucial factor in the upcoming election. Now a pertinent question is: What is the implication of this verdict on the political environment of the country. This verdict conveys a strong message to all politicians that nobody is above the law. Thus, the political leaders should learn a lesson from this trial. AL leadership should consider some of the burning issues of the country those are related to charges of corruption in different sectors, including the banking and education sectors. Strong actions should be taken against those who are found involved with these scams. If AL leadership could bring these people before the trial, this would help them to gain public support in the upcoming election. Another important issue is that they should also take the issue into account that a changeover in the political power would put those people under the same nature of trial. If the practice continues, this would ultimately be good for establishing the rule of law in the country. At the same time, it is also desirable that the law should be applied equally to all. There are several criticisms from the BNP leaders as well as other corners of the society on the issue of Khaleda Zia’s conviction. Many of us have expressed their concern about the timing of the judgment as we are approaching towards the 11th parliamentary elections in the country. Despite having criticisms, it is important to bear in mind that we should appreciate the judicial decision. If Begum Zia feels aggrieved with the lower court decision, she could go to the upper court for remedy. And if she could falsify this case in the upper court, she would be welcomed by the people of the country. This trial is a strong message to all those politicians who abuse their power and get them involved in corrupt practices. We strongly believe that once the process has started, it would continue. Only then, the rule of law would be established in the country that would facilitate the establishment of a corruption free Bangladesh.